Dreams about the future are always filled with gadgets. I am not at all a gear freak but firmly believe right gear makes life easier. During my doctoral studies in Wildlife Ecology, I spent over 5 years roaming on a two-wheeler in remote locations with very minimal stuff so I have some experience surviving with basic stuff in the boonies. 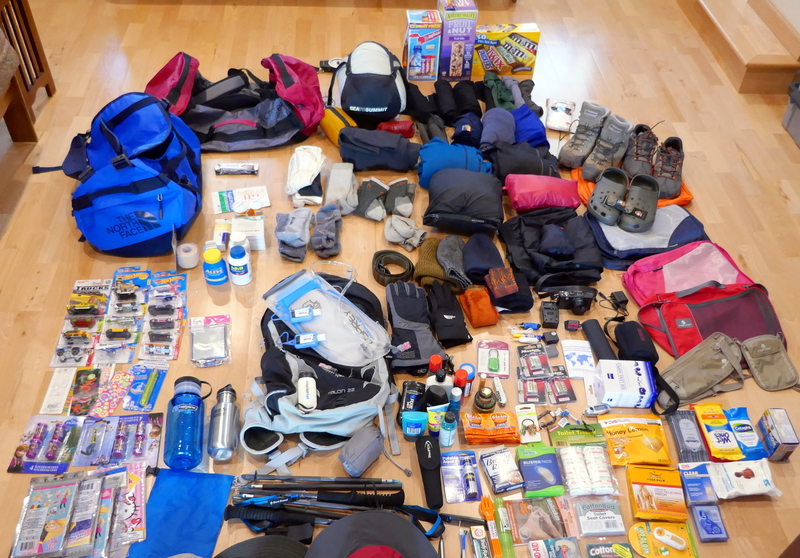 Over the years, I have traveled extensively and have gathered and tried several gear so thought to share some of my views about the stuff I took with me to Everest Base Camp (EBC) trek. Weight considerations for Lukla flight and porters: Basic idea is to have all your stuff under 15 to 20 kg for the Lukla flight and also for the safety of the porters who will carry it from one teahouse to the other. Varied climatic conditions during the trek: The weather changes quickly in the Himalayan mountains. You are likely to encounter hot and sunny weather in the beginning, some rain, and towards the end of the trek below freezing weather. Conventional wisdom is to dress in layers and carry rain barriers. Amenities at local teahouses/lodges: Amenities at the teahouses and lodges are very basic so you will need to carry toiletries, towels, water purification system, head-lamps, first-aid kits, etc. Clothing: Stuff that goes on your body from hat to socks. 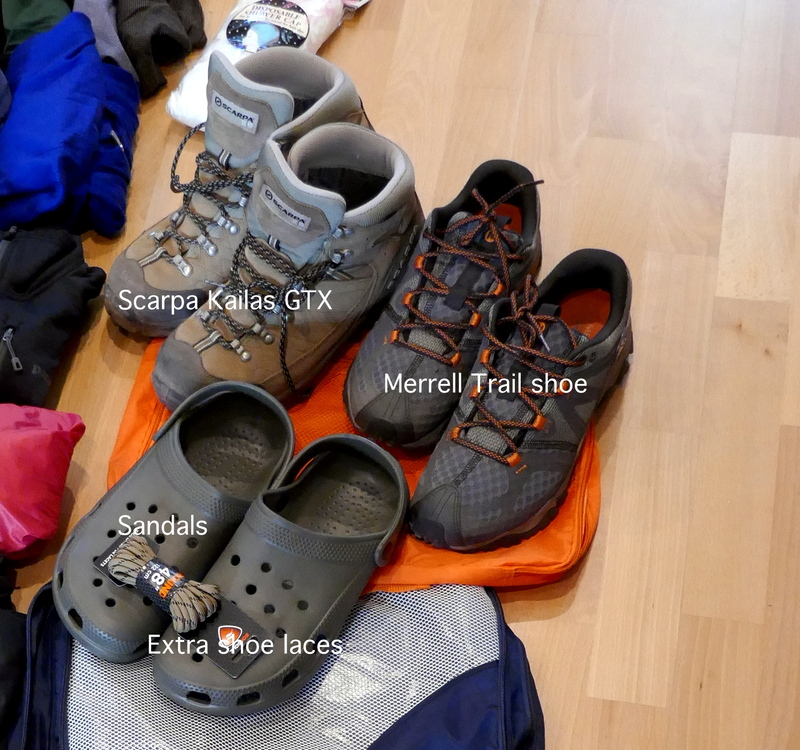 Hiking gear: Stuff you carry or hold such as hiking Boots, Poles, backpacks, etc. Electronics and gadgets: Cameras, phones, chargers, headlamps, etc. Because weather conditions can vary from hot & sunny to freezing cold, the best clothing approach is layering. This includes a base layer, mid layer, and outer shell. I am a huge fan of merino wool base layers (including socks!) and have been using it during winter months in the USA. In my experience, merino wool base layer becomes an extension of my skin and I don’t even feel it. Due to its inherent antibacterial qualities, it will not stink even if you skip a shower or ten. My choice of base layer has been Icebreaker brand tops and bottoms in lightweight (200) or mid-weight (240-260). Tops: I took three Icebreaker full sleeves 200 weight tops (one with fitted hood) and one short-sleeved. I used it daily throughout the EBC trek and was happy with it. In my opinion, Icebreaker tops have slightly longer sleeves so even with any physical activities; the sleeves will not pull up. Bottom: Again, Icebreaker Merino Wool bottoms. I took three and used them as base layer after Namche Bazaar all the way up to the base camp. I slept in them (with REI fleece pants) and they worked out well. Underwear: My choice is Exofficio travel underwear. They are quick drying and comfortable for extended period of travel. I took 4 pairs knowing I wont have opportunity to wash them on the trail except Namche Bazaar where we got some laundry done. Socks: Based on my experience, SmartWool PhD, Darn Tough Hikers Micro crew cushion, and REI SmartWool no-itch hiking socks are the best. I took two pairs of REI SmartWool full length socks, two pairs of Darn Tough, and two pairs of SmartWool PhD low-cut socks. I have been using these brands for a long time and highly recommend them for hiking and other outdoor use. I like the fittings of PhD brand socks for all around use and the other two for hiking. The SmartWool heavy weight provides extra cushion and air-circulation wicking away moisture from the feet, which ultimately helps to avoid blisters. In addition, I took four pairs of REI Silk One socks liners and one pair of REI merino wool liner. Changing liners every day helped keep everything clean. 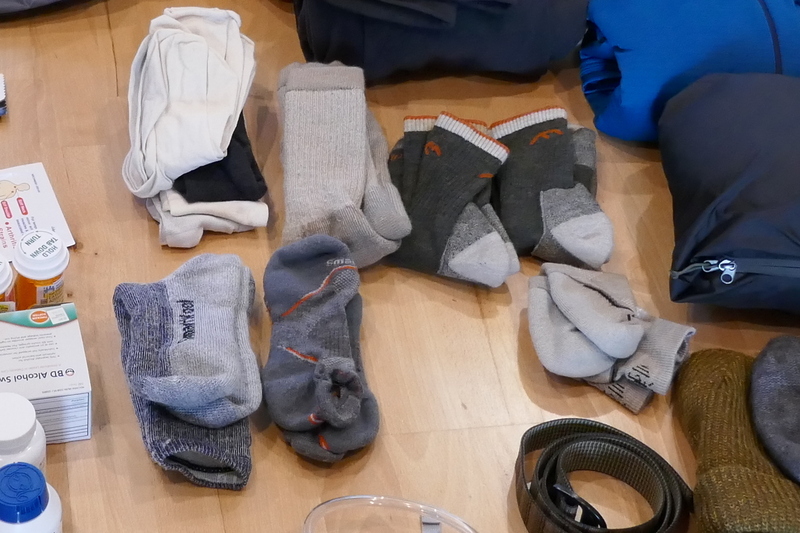 Additionally, the liners dry faster – I did hand wash one pair at Dingboche (where we spent two nights and had access to an indoor drying area at the lodge) and that was enough for the entire trek. Again, these socks are made from merino wool (anti-bacterial) and hence controls odor issues. Top: I took two Patagonia R1 fleece pullovers, one with hood and the other without. I have been using them during winter and found to be the best as a mid layer. I could have gone with Patagonia R2 or even R3 for higher insulation but didn’t want to invest in them just for the EBC trek. R1 is perfect for California winter and all around use. Bottom: I took one pair of REI Teton fleece pants and that was enough. I slept in them pretty much everyday after Namche Bazaar and used as mid-layer during the last two days (Lobuche & Gorakshep) and it was perfect. They are super comfortable and warm enough for the EBC trek use. Top: I had one down insulated half vest (REI brand – light duty) and one North Face Nuptse Down Jacket (700 fill). Both of them were extremely useful. Half vest was useful during early morning and nighttime at the teahouses and the Nuptse down jacket kept me warm during the last three/four days. Except the hike to EBC and Kala Patthar, you don’t need such heavy-duty down jacket during hiking but it’s good to wear during early morning sunrise photography outing as well as nighttime use at the teahouses. When it got too cold, I slept in this jacket and it was comfortable enough. I highly recommend carrying both if you are hiking EBC trek in winter months. Bottom: I do not like thick and heavy bottom layer while hiking. I used Icebreaker bottoms as base layer when needed. My favorite hiking pants are Marmot Arch Rock and REI Sahara. Marmot Arch Rock are my go to pants – they are breathable, quick drying, lightweight, packable, and very comfortable pants. I took one Columbia amphibian, two Marmot, and one REI Sahara pants for the EBC trek. I wear these pants during traveling, outings, and often in my daily life and like them a lot. I prefer them with zipper pockets but Marmot does not have that choice, Columbia, Exofficio, REI, etc. have some designs with zipper pockets. Belts: My favorite all-purpose belts are Bison Designs friction belts. They are made from synthetic nylon type tightly webbed material and extremely durable & washable. They come in two widths and I like the wider ones as they don’t twist under my big tummy! Bison Elliptagon Belts has no metal parts so occasionally I can go through the airport security screening without removing them. Outdoor Research Seattle sombrero rain hat and Patagonia Alpine Houdini rain jacket protected me from rain. Rain gear: Any breathable rain jacket and pants will do. You can even use rain poncho that can go over your daypack serving dual purpose. In my case, I had Patagonia M’s Alpine Houdini jacket and Marmot PreCip Full-Zip pants. The Alpine Houdini jacket is ultra light and breathable so works extremely well while hiking in rain. Both of these are extremely light and packable so easy to carry in your day pack (not in the duffle carried by the porters) so if you need it during the day you can access them easily. The Marmot rain pants have full zipper so I can quickly put it on without removing my hiking shoes. I believe both of these items are a good investment and will serve beyond the EBC trek. They are also very effective as wind barrier so you can layer them over mid layer to protect from wind chill. Make sure you buy appropriate size to go over a few layers. 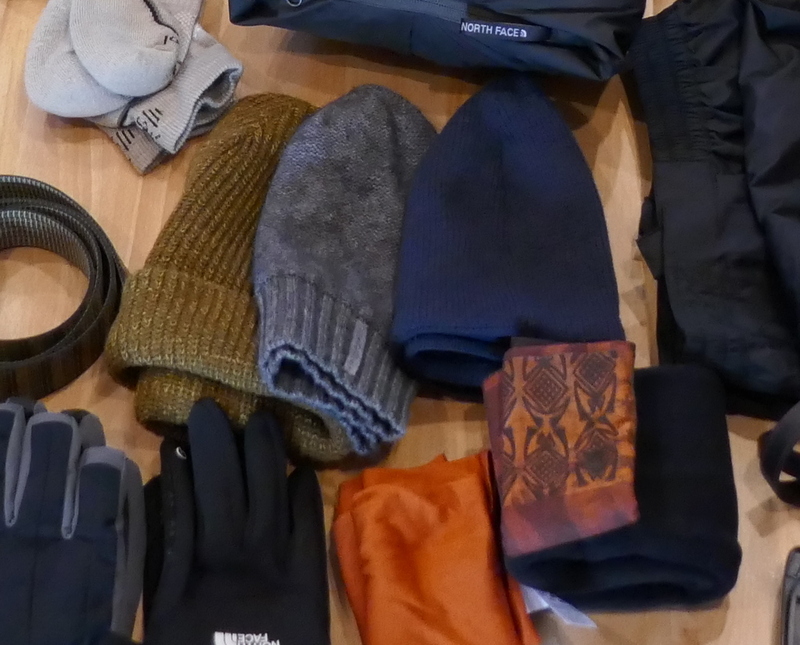 Head gear: I had two North Face Beanies, one Outdoor Research Seattle sombrero hat, One woolen skull-cap, two buffs (one regular and one merino wool), one neck gaiter, and one OR Sahara hat. That many? Probably true but they each serve a unique purpose. The light and heavy-duty beanies kept my rapidly balding scalp warm; the skullcap was useful as a layer when it got too cold or for sleeping purpose. I can’t imagine myself without a buff on the EBC trek.With over a dozen ways to wear them, I had one on me pretty much everyday during the hike. It protected me from the trail dust (combined with dried up yak poop!) and kept me warm during the hikes. Since I wear prescription glasses, anything that goes over my nose fogs up my glasses so I had to constantly tinker with them. Balaclava does not work for me for the same reason. If you buy Buff, make sure you buy one that is long enough to pull over your nose/head if needed. Apparently, they make them in various lengths. I prefer merino wool buff over regular synthetic one for warmth and I even layered them when it got too cold or windy. Gloves: I didn’t have heavy-duty gloves suitable for the EBC trek so I bought Outdoor Research brand gloves with liners rated for extreme low temperature. As I wrote in my account for Day 9 (Gorakshep to Kala Patthar), my fingers got extremely cold and numb with these gloves and liners that I almost thought about junking them on Kala Patthar. They feel they were not very effective considering the temperature they were rated for.The North Face E-tip gloves were good and worked well during moderate cold. They are supposed to be touch screen compatible but didn’t work half the time with my iPhone or Camera LCD. 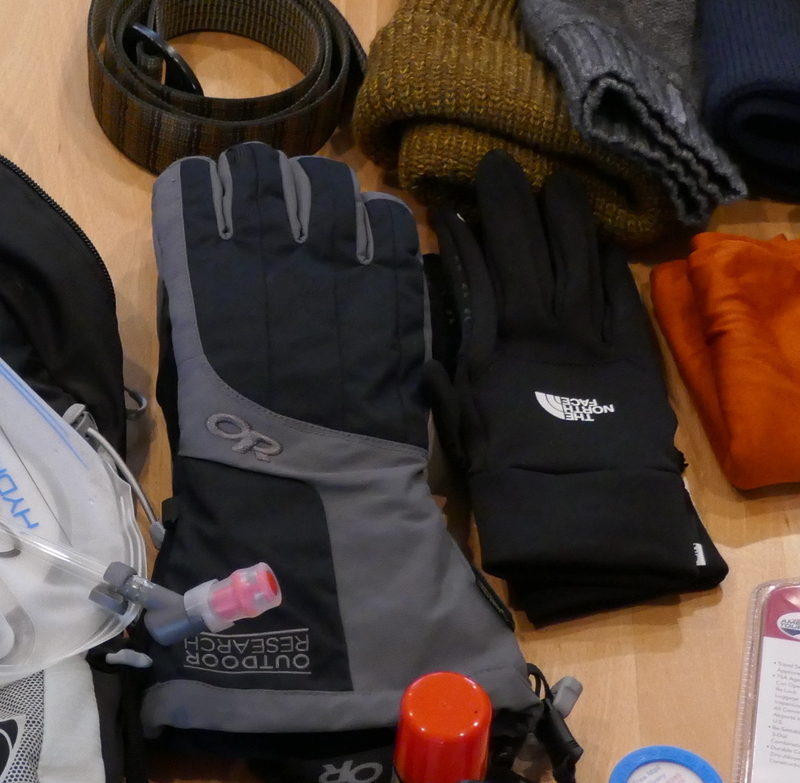 Outdoor Research and North Face Gloves. Hiking boots: I have two hiking boots that I use routinely, one is Scarpa Kailash GTX (my all time favorite) and the other one is Vasque Breeze 2.0 Mid GTX Hiking Boots -the one I used for the EBC trek. Both of them were used for several months before the EBC trek so they were broken in. 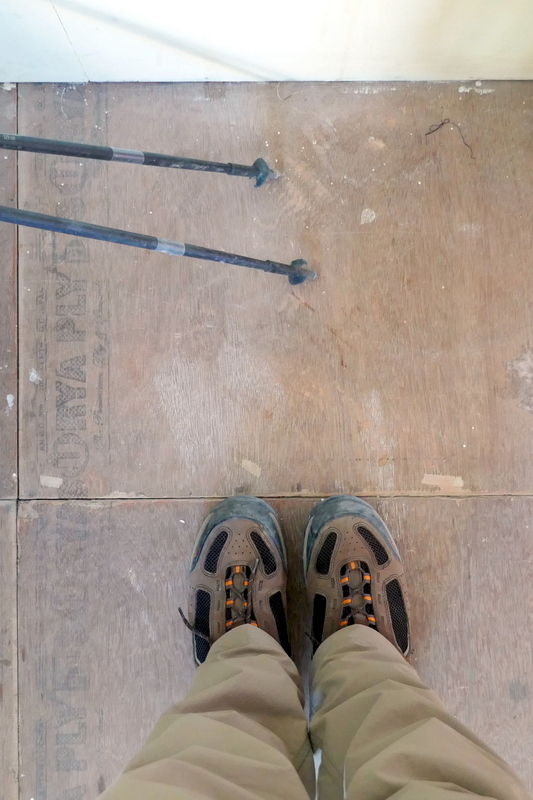 Originally, I was going to take Scarpa – my favorite hiking boots – for the EBC trek, but they tend to run narrow and with thick SmartWool socks and a liner I was afraid they wont be as comfortable as my Vasque Breeze boots. Both of them are Gortex coated so supposed to be waterproof. Finally, I decided to take Vasque boots and they worked very well. Merrell Trail runner: These are my all-purpose trekking shoes for light hikes and roaming around unpaved surfaces. The outer shell has mesh and the mid layer is perforated so they are super light and breathable keeping my feet dry and comfy during extended period of light trekking. They do not have ankle support so I do not recommend for the actual EBC trek. Also, they are not waterproof or insulated so not suitable for extreme cold conditions during the last few days of the EBC trek. On my return trip, I spent a few days in Dubai and went on a Desert Safari wearing these shoes. While they were comfy, the sand penetrated through the outer mesh and it was very difficult to get it out. Casual Sandals (like Crocks but cheap): I use them in my garage and in the backyard while gardening and took one pair with me for the EBC trek to wear during showers and inside the teahouse. They are super cheap (<$5 a pair), waterproof, and enclosed so I can wear them with socks. I buy them from a Japanese store (Daiso) near my home and have been happy with the quality and durability. They were super useful during EBC trek as I can shower in them and walk around the teahouse with my SmartWool socks on. My trusty partners throughout the EBC trek. I use Black Diamond Distance Carbon Z trekking poles and love them. They are the lightest poles made by Black Diamond and are three section foldable (as opposed to other telescoping poles). Because of this folding design, they fit inside my daypack and can be deployed in seconds by pulling the handle upward. The breathable foam grip is very ergonomic and the strap is adjustable without much hassle. They are entirely made with carbon fiber so extremely sturdy. Unlike aluminum poles, they can snap if stuck in a rock crevice so you have to be careful negotiating your way through the rocky terrain. It almost happened to me while going through the Khumbu glacier moraine just before the base camp but luckily they didn’t snap. Please try your hiking poles with gloves to make sure the hiking pole strap is large enough when you use gloves. Airlines do not allow them in carry-on baggage so you have to pack them in check-in baggage. My bag with these poles didn’t make it to Kathmandu from Dubai with me – it took two days to arrive and I suspect it was due to these poles. If you forgot or lost your hiking poles, no worries, you can purchase them while on the trail. Doctor and Kamlesh realized a need for hiking poles after our acclimatization hike to Nagarjuna peak and were able to buy genuine looking Leki poles at Dingboche! Black Diamond Distance Z Carbon hiking poles. Typically, you need two pieces of luggage for the EBC trek. One is for your overnight stuff that porters (or Yaks) will carry and the other for your day needs that you carry.For the overnight stuff, you would need some sort of duffle without wheels or rigid frame so it can be tied down to yaks or porter’s basket. Additionally, wheels or internal/external frame makes them heavy for the porters to carry. Bimal, Our trek organizer never mentioned that he will be providing heavy-duty duffle bags (top one in the following picture) for the trek. Basically, the way it works for the organized EBC treks is that the organizer will likely provide identical duffle bags marked with their company name and logo for two reasons, (1) avoid damaging your personal luggage, and (2) porters can easily recognize them for hauling from one teahouse to the next. Every morning, porters will come to our rooms and ask if we have packed our duffle so they can collect them and get ready to trek. Since I didn’t know that, I bought an Eagle Creek 90L Cargo Hauler Duffle (the one in the middle in following picture) for the trek. Eagle Creek makes very durable travel gear and I admire the quality and durability of their products. I elected to use my own duffle and not the one Bimal provided because I liked the two large zipper side pockets to organize my stuff for easy access. I used a heavy-duty contractors cleanup bags as an inside liner for my duffle to create an additional protection from rain. In addition to the overnight duffle, I carried Osprey Talon 22 backpack with integrated hydration system. I could have gone a bit bigger size – 28 to 32 gallon but I had this bag for my California hikes and didn’t want to spend additional money to buy another. It was big enough to carry my ultra-light packable rain gear, first aid kit, water, snacks, etc. It has a mechanism to attach hiking poles and adjustable harness. I use it all the time for day hikes and am very happy with it. Since we decided to hire an additional porters to carry our daypacks, I only carried it two times throughout the EBC trek.This pack has a separate hydration compartment big enough for 3L water hydration pack, two side pockets with straps, one large stretchable front pocket, and a small zippered compartment to carry important items such as passport, camera cards, phone, etc. while on the trek. Also, don’t forget the rain cover for the daypack. I have been using Steripen to treat water when traveling in remote areas and have never had any issues with waterborne illness. My first SteriPen Classic was a much larger version and I used it for several years traveling in India, Mexico, etc before giving it away. I bought the most recent version (Classic 3) that uses AA batteries and is compact enough to carry in backpack. In addition, I carried some water purification tablets from REI. Originally, I was planning on using Steripen to treat water available from the streams and hotels but after a day or two decided to purchase bottled water as it was convenient and reasonably priced. As an environmentalist, I do not use disposable water bottles and if I have to use them I make sure they get recycled. 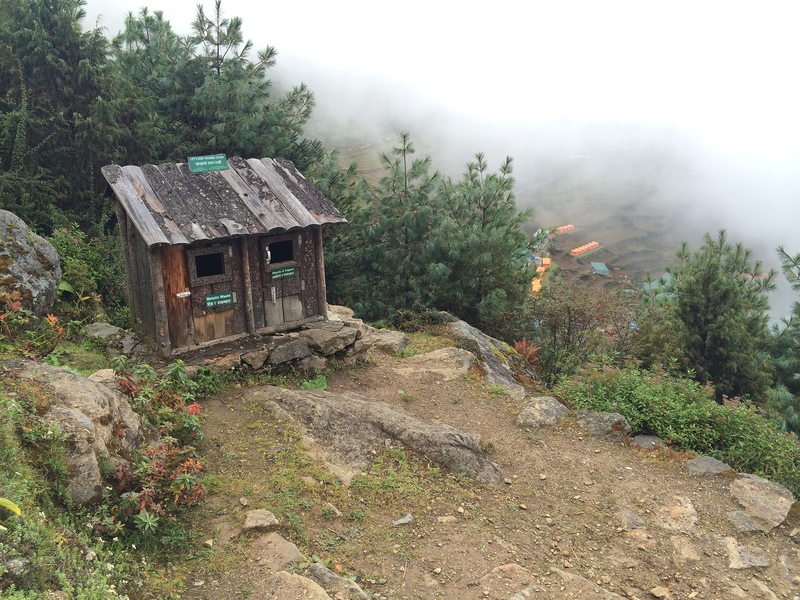 I was pleasantly surprised to see Recycling stations along the EBC trail (probably up to Tengboche ). These are managed by Sagarmatha Pollution Control Committee and they seem to do a fabulous job keeping EBC trek litter free. Additionally, teahouses also recycle plastic bottles so I felt a little better using bottled water. I did use Steripen while in Kathmandu and my three-week trip to India after the EBC trek. 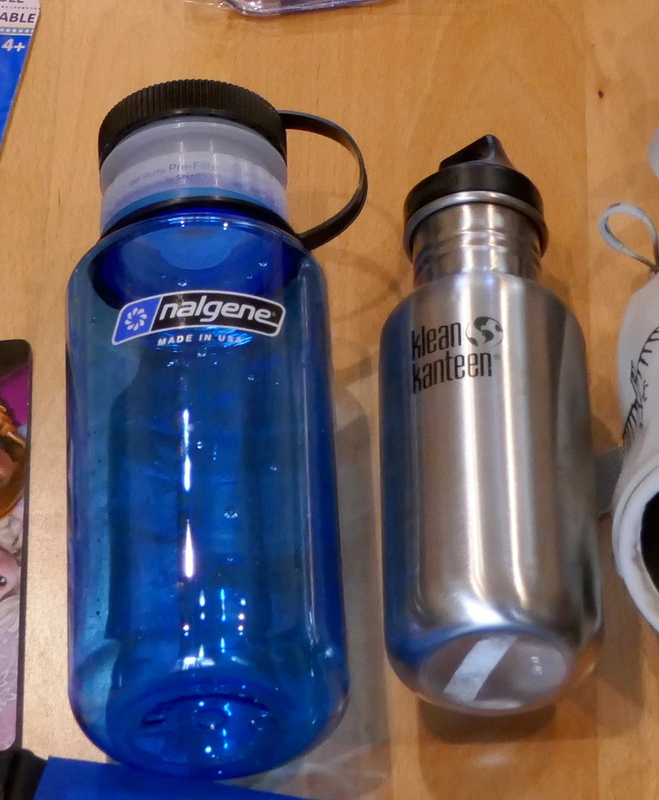 In addition to the Osprey Talon with hydration pack (or bladder), I carried two water bottles for the EBC trek. Since my daypack was carried by the porter, I solely used these water bottles during the EBC trek. The electrolyte tablets (Nunn Energy and ZipFizz from Costco) were easy to use with bottles compared to the hydration pack. Some of these tablets stains hydration pack and makes it difficult to clean after a day or two. Photography has been my passion for many years and I own and use multiple DSLRs and film camera systems. The most difficult choice I had to make was to leave my Canon 5D and all my Canon L series lenses at home and carry only one point and shoot camera. My primary concerns were weight restrictions and environmental factors on the trail. Although I regret not taking my DSLR Camera system, my Panasonic Lumix ZS100 proved to be a great camera for the EBC trek with an impressive 25-250 zoom range at F 2.8 to 5.9, 4K video, electronic view finder, post focus photo capture and several other cool features. I am writing an in-depth review of this camera (specifically for EBC trek) on my blog post and will link it here. My iPhone (with Verizon service) worked in Nepal with Nepalese SIM cards. First thing Bimal did when I arrived to Kathmandu was to take me to purchase and install Nepali – NCEL SIM card. 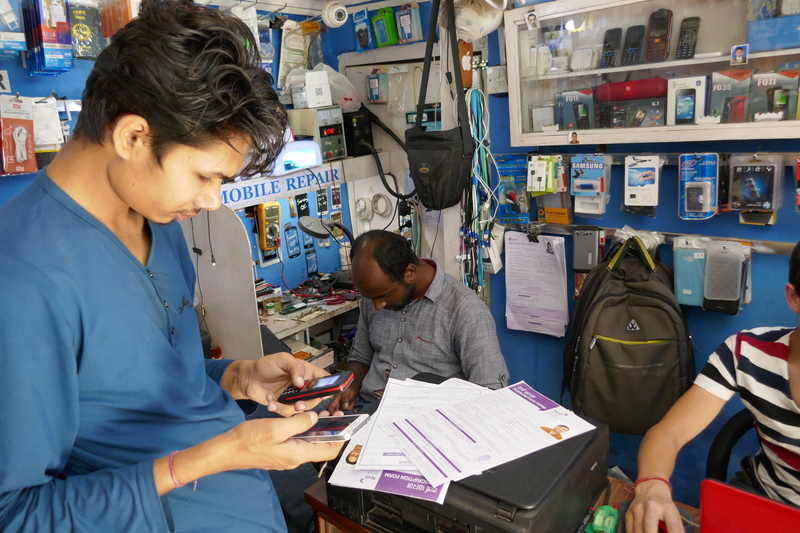 Nepal (and India) has pre-paid SIM card system and I think I paid about 2000 NPR to load some balance on the SIM card which was enough for my use in Kathmandu and during the trek. There are two types of SIM cards in Nepal, the NCEL works better than NTC for the EBC trek. I was surprised that we had good cell phone coverage pretty much all the way to Gorakshep with some dead zones here and there. Installing Nepalese NCEL Sim card in my iPhone at Thamel. I didn’t carry powerbank or other external battery charging system with me and charged my iPhone at the teahouses whenever I got a chance. If you use your phone to take photos, you may need a powerbank to keep your phone charged as you may not be able to charge it at teahouses if they are crowded. I was on a “digital detox” program and extremely limited my cell phone use while on the trek. Others in our group had powerbank and they found it very useful. They suspect that powerbank in their checked baggage may have caused some security issues as they got their bags with powerbanks a day later. Peak Design Capture Pro clip is my most favorite camera accessory. 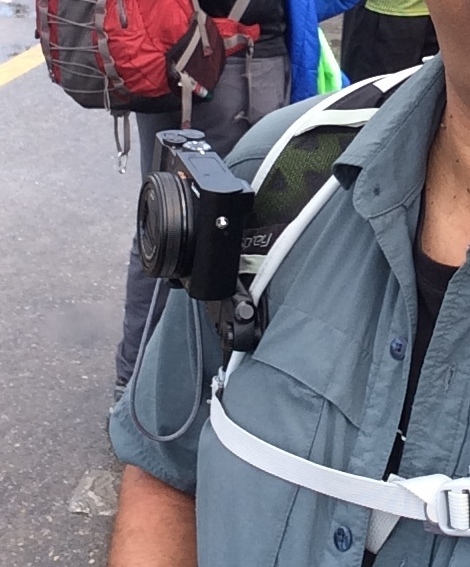 I have been using it for a year now and found it to be a great way to carry my camera while hiking. This clip attaches to any backpack strap, belt, or bag. It has a quick release button to access your camera quickly. I bought the kit with point-and-shoot mount as well as GoPro mount. 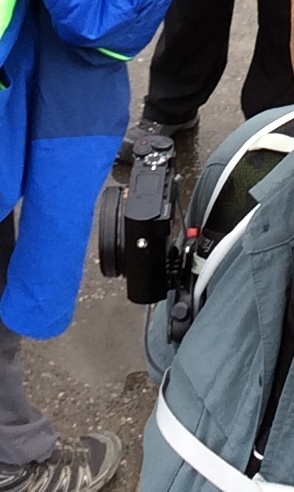 Since we hired a porter to carry our backpacks, I didn’t use it much during the EBC trek but Doctor Dipak attached his GoPro to this clip and mounted on a backpack our guide carried and recorded hours of video. I used it during the initial part of the trek and also during my travel around Kathmandu as well as India. I highly recommend this for hiking and travel photography. I am writing a detailed review of this product on my blog and will post a link here soon. Hand sanitizer (small bottles): I used a D ring to attach these bottles on my daypack. Shampoo & Soap: Yes, I showered pretty much everyday except last two days. Toothbrush, Toothpaste, mouthwash: I used a travel toothbrush with carrying case. Shaving needs: I shaved almost everyday with icy cold water. Sunscreen: I used SPF50 made for children. The UV radiation at higher elevation will show up on your face after Lobuche. Wet wipes and baby wipes. Smaller packs are better to handle. Toilet papers and seat covers: Smaller rolls and seat covers made for camping. Avoid one large toilet paper roll. Hiking Salve: I use Joshua Tree Hiking Salve and love it. They have two sizes and I took both and shared with my group. Very effective on dry nose/nostrils. Lens wipes: I routinely use Zeiss Pre-Moistened Lens Cleaning Wipes from Walmart. Works great for my glasses and camera lens. 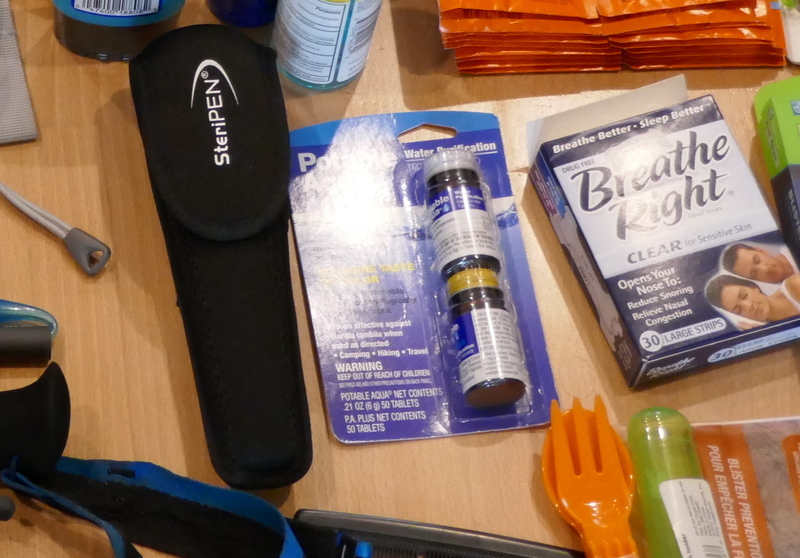 Toiletries, first aid, etc. Click for a larger view. Your daily medication in moisture proof container. Band-Air Adhesive strips in assorted sizes. 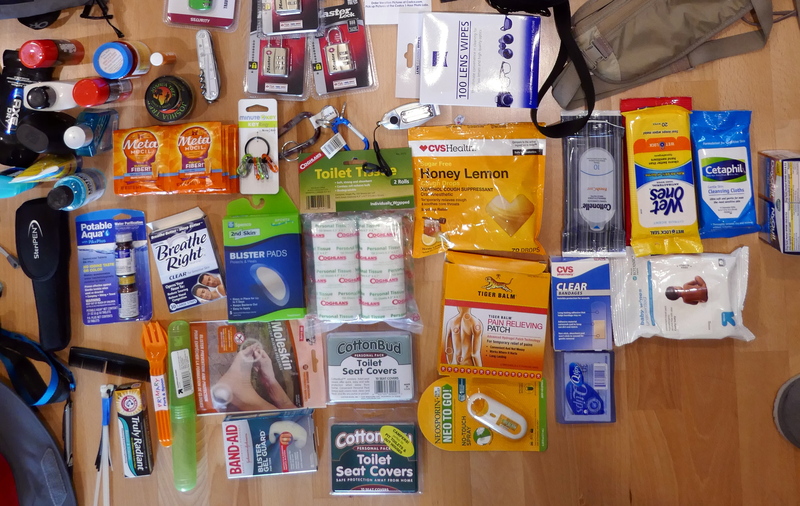 Blister pads, moleskin, Blister Gel guard, etc. (I hiked the entire EBC trail with two blisters I had before coming to Nepal and it was not fun. Click here for more info. Breath Right Nasal strips. I use it when I have stuffy nose and it helps control snoring. Your room-mate will thank you. Fiber supplement like Meta Mucil. Neo to Go: First Aid Spray. I attached it on my daypack with a small d-ring. Pain killer tablets of your choice. Aleve and Advil work for me. The best gift items to take for children are educational supplies (notebooks, pens, coloring books, maps, etc.). Experienced trekkers to Himalayan region do not encourage distributing gifts directly to children – it encourages unhealthy habits and may keep them away from school. Also, Nepalese authorities and NGO discourages gift giving (will link their website here later) along the trek. According to them, the best way to assist children living in this remote area is not to distribute gifts directly to them but work with local schools and help with educational materials and supplies through local schools and other agencies. It may be useful to help schools away from the famous trekking routes as they may not get such help. Headlamps: I bought LED headlamps from Costco, they came in a set of two and were inexpensive and bright enough. Several D-rings: Useful to tie hand sanitizer to backpack, secure water bottle on the side pocket of the backpack, etc. Whistle, compass, and thermometer combo. Although my Osprey backpack has a built-in whistle in the strap, I like this combo and attached it to my backpack strap. TSA locks. Buy both the regular and the cable type lock. Books to read, Playing cards, small notebook & pen. Quick dry towel in two sizes. Dry sacks. Various sizes. Eagle creek passport and money belts. Packing cubes. I love them and can’t live without them while traveling. Eagle Creek has the best designs but are expensive. Ikea and Daiso Japan has limited sizes but very affordable. Four passport size photographs. You will need one for the trekking permit (Trekkers’ Information Management System – TIMS), one for the sim card, one for the visa on arrival and keep one extra. Extra eyeglasses. Two sun glasses one for regular use and one suitable for snow. Finally, your favorite snacks. 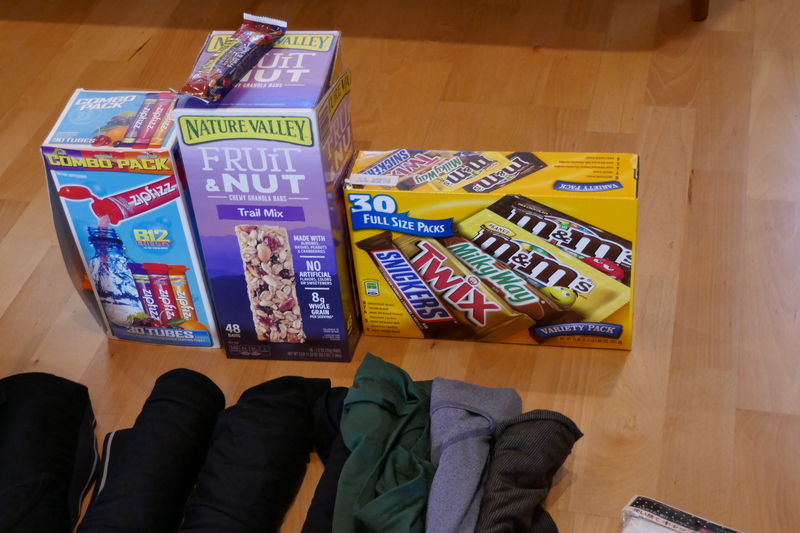 You will need lots of sugar on the EBC trek! Thank you “Sherpa Valley” for your very informative blog on Everest Base Camp. I researched many other blogs and found this one covered all my queries. My husband and I have just returned from Everest Base Camp 10/11/17. 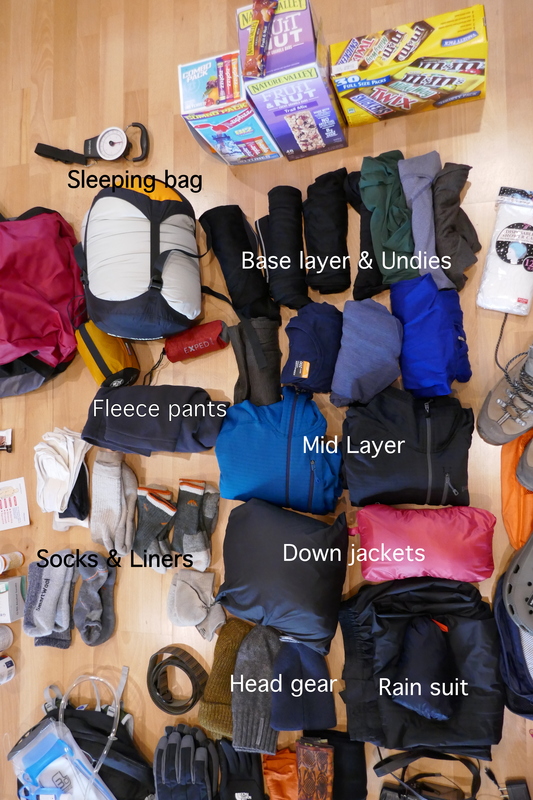 Your gear list helped us a lot and we slightly altered it to what we already had or could use without going out and buying up a lot of gear. As we live in a warm climate and did not have suitable sleeping bags and goose down puffer jackets, hiring them in Kathmandu was a great option for us. Hire was $100 US each for 15 days for both sleeping bag and jacket. Also duffle bags were supplied by the guide which we used, hence there was no need for us to take our big back packs to Nepal. Our duffle bag would of weighed less than 10kg each. We also had our day packs which would of weighed 5kg or less. We had a good first aid kit and the funny thing was, it was used on several occasions for other people and we didn’t require it ourselves. But we were prepared. We had the time of our lives, thank you for your blog once again. Thank you for your comment and congratulations for successfully completing the EBC trek. I am glad our blog helped you with your preparation. Sleeping bags, jackets, and duffle rental is a great idea for $100 as most of us may not have a need to use such items on other occasions. Happy trails..